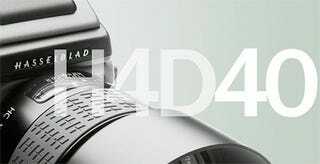 A whopping 40-megapixel beauty from Hasselblad has been outed before the official February 10th launch. At $19,995, it'll only be within arm's reach for a few people, though as you know they're a big name in the pro-photography world. While full specs haven't been announced by Hasselblad yet for the H4D-40, we do know they're billing it as the "perfect entry point." There's a new True Focus AF system and Phocus 2.0 software for managing those all-important pics, and it comes with an 80mm lens and viewfinder.